Happy Wednesday, I hope you're having a good day! Yes, another late post from me, I wanted to include a video to show you how I stamped the Multi Step Sunflowers from Kitchen Sink Stamps, and wouldn't you know it, the weather wasn't cooperating, so be sure to turn your volume up tad when you watch the video. Don't forget, today (June 23rd) is the last day for Kitchen Sink Stamps 6 Months 'til the Holiday Sale - CLICK HERE then enter code STAR at check out to save 20% on your entire purchase. Orders that total $60 before shipping, will also receive a FREE Mystery Stamp Set (Retail Value: 27.95)! If you are reading this post at a later date, you can still save 10% on your orders, see the link on my sidebar for more details. I used Basic Grey Basics paper in Kraft and Vanilla for my pattern paper, using a marker to add color to the Vanilla paper to coordinate with my Sunflower. After stamping my image, I cut the panel with Spellbinders Circle Dies, then layered on a Chocolate Circle. Added some Olive Seam Binding and a great button from the Accoutrement Line by Tim Holtz. Wow, another amazing video and card! I better hurry and shop! Beautiful Lisa! Your last couple of videos have made it look like a piece of cake to do all the steps! I just ordered the butterflies - which are hopefully not the most difficult to do!! Love what you do with these!!! 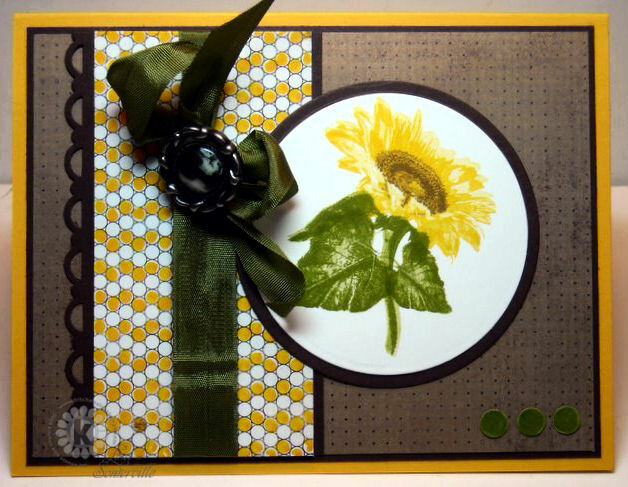 Gorgeous card, love the yellows & greens. Lisa, your card is beautiful. You have such a talent for layering, and of course, your image is wonderful. Your videos are great. That's a lot of work. No more sales please, I've run out of money and I've almost run out of stamps to buy. Very pretty card!! Thanks for sharing!! Gorgeous Lisa, just gorgeous. Fabulously stamped as usual. Love your flower cards with the tutorials. Very beautiful!